Power consumption by your home’s electronic devices continues to be a very important issue so we have made an attempt to present some simple power consumption tests on the various routers that we had. To measure idle usage, we reset each wireless router to the default settings and plugged them with no devices connected to them. We then measured the power draw from each router at the wall with our P3 International P4400 Kill-A-Watt electric usage monitor. 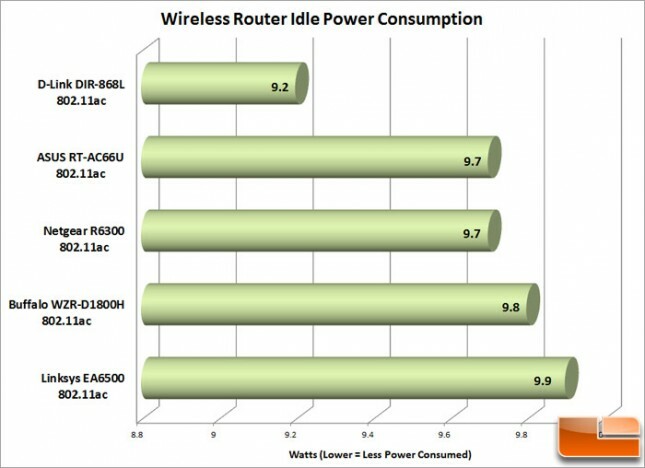 Benchmark Results: As expected, the D-Link DIR-868L consumes about the same amount of energy as that of all the wireless-AC routers. Since most people will have their routers turned on for 24-hour a day operation, we think that examining power usage is an important benchmark. Total cost of ownership (TCO) is an important financial estimate that helps consumer’s direct and indirect costs of a product. In our TCO calculation we will be figuring up how much it costs to have a wireless router running per year in an idle state with the unit being installed 24-hours a day. 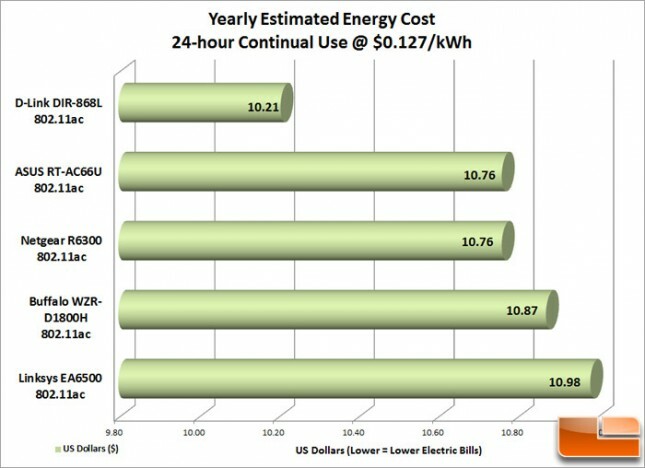 We will be using 12.7 cents per kilowatt-hour (kWh) based on the bureau of labor statistics report from April 2012 showing that amount as the national average. 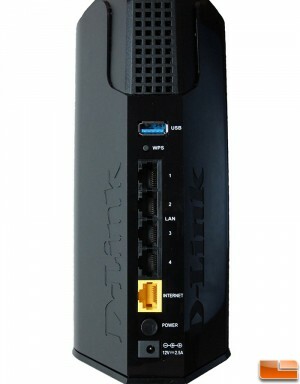 Benchmark Results: Because the routers consume roughly the same amount of power, the cost differences in owning one of these AC-routers is really very small. You might see a slight uptick in your electric bill when you make the move to WiFi-AC from Wireless-N but we think it is well worth the slight cost increase.